Politics and Sustainability: "Don't forget about the real world"
"Don't forget about the real world"
Which world is the real one? Philosophical questions aside the common answer is that the world our bodies inhabit is the real world. It is our bodies that must be fed, housed, will get cold so therefore have to be clothed, has sexual drives, and so on. It is hard to ignore the reality which contains our bodies. Second Life escapists told to wake up: Concerns a campaign launched within Second Life by the World Development Movement to raise consciousness about global poverty. They have taken this campaign into Second Life because it seems a lot of people are paying more attention to a virtual paradise rather than the physical one. 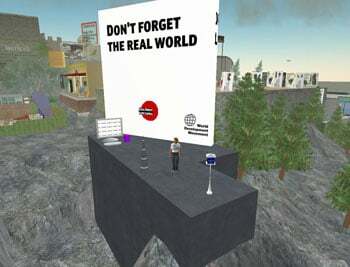 Second Life equal with First Life: "Nearly half of all Americans who belong to online communities claim that the virtual world they inhabit is as important as the real world." Well, okay, I'm not sure if they're making this out to be a bad thing or not. On the one hand the Internet offers us a way to connect people based on their interests rather than their location. In the past society had bad communications and travel capabilities, and the only people you could connect with were the ones who lived next door or in the next town over. But what if your interests went to speed skating, but you lived in an equatorial town that had no skating rinks and nobody else cared about ice skating much less speed skating? You might get laughed at just like the Jamaican Bobsled Team earns weird looks every time someone talks about them. At the same time we have this real world that our bodies inhabit. What are we ignoring when we ignore that world? There actually is an analogy in the real world inhabited by our bodies. Think of the way mainstream news often gets distracted by unimportant events. For example the Scott Peterson story where he killed his wife in a gruesome, covered it up in a gruesome way, professed innocence, etc. It was a huge story in the media, and it was a tragedy, but in truth lots of wives are killed by their husbands every year, and for that matter lots of husbands are killed by their wives every year. Why did that story get the coverage and the others did not? Further, what important stories were skipped over because the available time in the evening news was spent examining minutae of Scott Peterson's life? In other words, there is a lot going on in this world which distracts us from what is really going on around us. Online communities, especially the immersive online virtual worlds, are just one of them.